Black and white portrait of two men, seated. 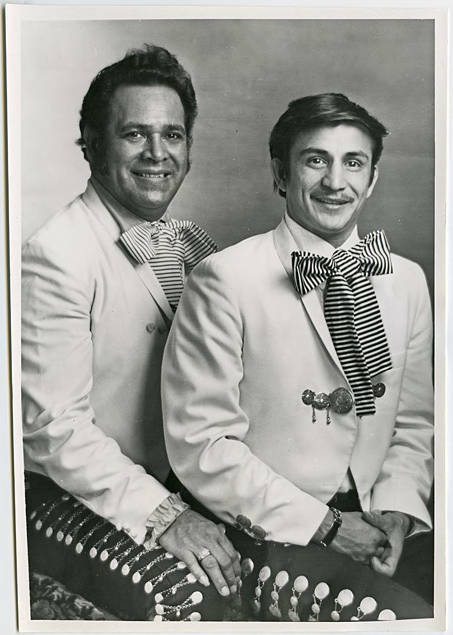 Both men appear to wear the more modern traditional 'traje de charro' costume of the mariachi musician: fitted pants with elaborate decoration, especially along the side seam, and short, fitted jackets decorated with elaborate silver buttons. White shirts and large, striped bow ties complete their costume. See also WCMpic_014506.